Danny Dover is a passionate SEO consultant and influential writer. During his tenure at SEOmoz.org (as Lead SEO), he did SEO consulting for many of the world's most popular websites including Facebook, Microsoft, and Comcast. His oft-cited expertise has been translated into Japanese, French, Spanish, Italian, Chinese, German, and Hungarian. He has spoken at numerous SEO conferences and his writings have been accessed online in more than 175 different countries. Erik Dafforn is Executive Vice President and Director of Organic SEO for Intrapromote, LLC, a Cleveland-based Search and Social Marketing firm. He's written over 200 articles on SEO strategy and techniques. 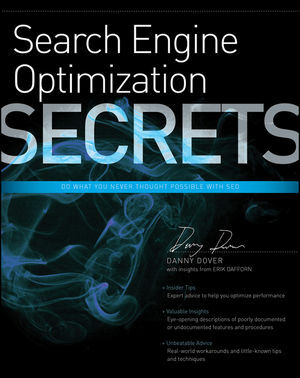 Danny Dover's Search Engine Optimization (SEO) Secrets Web site Visit author Danny Dover's site for more information on SEO Secrets and Danny's onging work.